When the Canadian Medical Association condemned the NHL for not addressing violence in the sport, a senior league executive described the criticisms as “imbecilic rants by dumbass doctors who have no idea what they’re talking about,” according to newly disclosed court documents. In November 2013, the then president of the CMA - a group with more than 80,000 physician members across the country - wrote an open letter to the NHL, urging the league to address a growing number of player injuries and subsequent suspensions. Louis Hugo Francescutti, an emergency medicine physician and professor at the University of Alberta, wrote that the CMA had hoped that a resolution endorsed at the association’s annual meeting in 2013 condemning NHL executives and owners over violence in the sport might help reduce the “carnage” when the NHL season began. A news release that included Francescutti’s letter was forwarded by a reporter to NHL deputy commissioner Bill Daly, who sent it on to Julie Grand, the league’s deputy general counsel. Weeks later, on Jan. 17, 2014, Grand asked NHL vice-president of media relations Frank Brown to respond to the doctor’s open letter. Brown replied that he planned to work on a response over the weekend. “There’s 13 hours of Hockey Day in Canada to watch tomorrow – perfect white sound for the creation of deep thoughts about imbecilic rants by dumbass doctors who have no idea what they’re talking about,” Brown wrote in an email to Grand. The CMA and NHL both declined to comment on Friday. Brown’s email was included in a series of exhibits filed in U.S. federal court in Minneapolis late Thursday that relate to a lawsuit filed by former players suing the league over its handling of concussions. The players allege that the NHL has put profits ahead of player safety and that league officials like Brown have been dismissive of any critics who second-guess the NHL’s policies and injury protocols. In the latest twist in the high-stakes case, former players are asking the court to certify the case as a class action. If the court approves such a move, which won’t come before next summer, it would mean more than 5,000 former players, and the families of some deceased players, would automatically become plaintiffs in the case, drastically ratcheting up the potential liability for the league. If the court rejects the class-action motion, players would have to hire their own lawyers and pursue claims individually. As part of their motion for certification, lawyers for the former players have outlined how they believe the NHL has willfully put player safety on the backburner. Evidence filed Thursday also includes emails from NHL doctors and league and team staff discussing how much information about concussions they should disclose publicly. Other emails filed in court include claims from NHL officials that some players might be exaggerating their injuries. In 2009, according to court documents, Dr. Charles Tator, a leading Toronto brain injury researcher, criticized a DVD released by the NHL about concussions in hockey. Tator wrote to Dr. Ruben Echemendia, who chairs the NHL/NHLPA Concussion Working Group, arguing that the video prepared for young hockey players included no details about the long-term consequences of concussions, such as dementia, depression, and suicide. Similarly, Tator noted that the video failed to discuss how many NHL players had their careers ended due to repeated concussions. On Feb. 22, 2011, NHL senior vice-president of hockey operations Kris King wrote an email to Grand, NHL vice-president of communications Gary Meagher, and University of Calgary epidemiologist Willem Meeuwisse, a member of the NHL/NHLPA concussion working group, to suggest the league begin tracking when concussed players returned to play in the same game. Much of the evidence the former players plan to rely on is still under court seal, including a number of exhibits used as part of Thursday’s class-action motion. More sealed documents could become public in a matter of weeks, said a lawyer involved with the case. In January 2011, the NHL was preparing a video explaining how concussed players had suffered their injuries. Meagher wrote in an email to King, Grand, Brown and Colin Campbell, the NHL’s senior executive vice-president of hockey operations, that the league might face scrutiny because it did not involve “independent 3rd parties” in its presentation. In attempting to make a case that the NHL has whitewashed its concussion problem, lawyers for the former players pointed to a study published in 2011 by doctors involved with the NHL’s concussion working group. 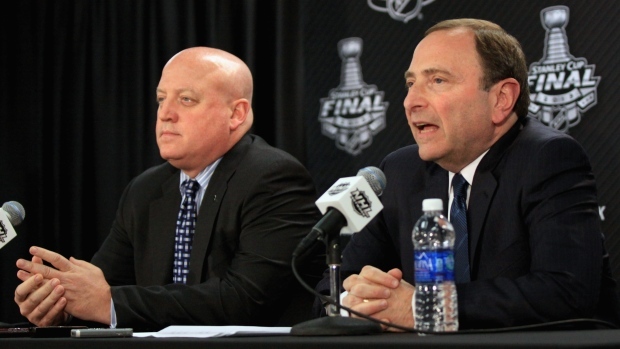 Other emails unsealed Thursday highlight a rift between the NHL and NHLPA over concussions. On Jan. 27, 2009, NHLPA spokesman Andrew Wolfe emailed colleagues a copy of a New York Times story reporting a sixth deceased former NFL player under the age of 50 had been posthumously diagnosed with the brain-withering disease chronic traumatic encephalopathy, or CTE.